KFC has launched a print ad that apologises to customers for a chicken supply shortage that shut down stores across the UK this week. The ad was created by Mother London, the fast-food chain’s UK creative agency since last year. It is running in The Sun and Metro today (23 February). 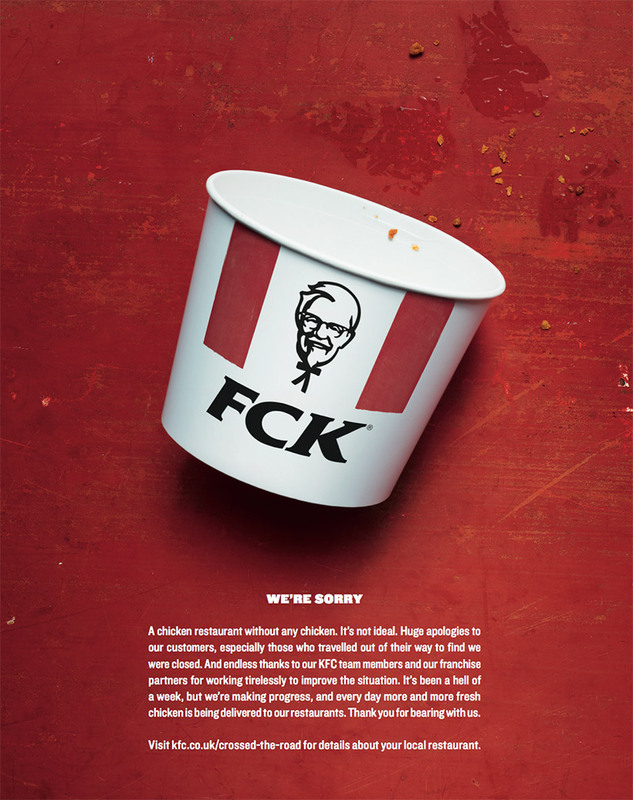 Keeping the sense of humour that has characterised KFC’s communications throughout the fiasco so far, the ad rearranges the letters of its name to spell out "FCK" on a chicken bucket. Text below the image reads, "We’re sorry." "A chicken restaurant without any chicken. It’s not ideal," the statement continues before apologising to inconvenienced customers and thanking KFC employees. "It’s been a hell of a week, but we’re making progress." The ad points viewers to a website with more information about the status of local restaurants. The header of the site reads, "The chicken crossed the road, just not to our restaurants." The chicken shortage kicked off at the beginning of this week after KFC switched its delivery supplier to DHL on 14 February. DHL blamed "operational issues" for a disruption in deliveries, causing the fast-food chain to close most of its UK outlets. As of yesterday KFC had reopened 700 of its 900 UK restaurants but had not said whether they were all serving a full menu.